Welcome to the website of artist Philip Stein, aka Estaño / 1919 - 2009. Philip Stein wrote the definitive biography of David Alfaro Siquieros. Titled Siqueiros, His Life and Works, the book is the result of the author having worked with Siquieros in Mexico for ten years, helping the master create some of his most renowned murals. The 400 page book provides incredible insights into the work, life, and times of one of the world's greatest political artists. The authoritative volume includes 72 pages of rare color and black & white illustrations and photographs. Also presented in Stein's book is an up close look at the Mexican Muralist school itself - its motivations, objectives, triumphs, and lasting contributions. David Alfaro Siqueiros created inspired, monumental art in the midst of social action and turmoil. He won the top award at the XXV Venice Biennial, and was unsurpassed as a modern portrait painter. He became the muralist champion of modern realism, who brought his public art forms into direct relation with the viewer. 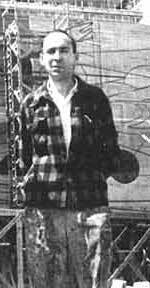 His passionate commitment to art with social justice cost him many years in exile, several arrests and years in jail. He was a soldier in the Mexican Revolution, and again in Spain. He organized the miners in Jalisco and was elected president of their union. Siquieros (left) with Estaño in 1953.
well-known belief, Dios no Existe. only their good friend in order to help them cure themselves." The publicity in the newspapers had been riot-provoking, and Rivera's adamant stand - "I will not remove one letter from it" - brought forth a mob of some thirty students who crashed into the Hotel del Prado, vandalizing everything in their path. In the dining room, the site of the mural, a knife was used to scrape the words no existe from the mural, leaving Dios untouched. Malevolently, they further violated the mural by defacing the self portrait of Rivera as a young boy. Newspaper reports praised the desecration of the mural. On the very night the mural was assaulted, not two blocks away in the restaurant Fonda Santa Anita, Rivera, along with Mexico's leading artists and intellectuals, was attending a dinner honoring Fernando Gamboa, director of the museum of Fine Arts. Gamboa was speaking on the threats to freedom of expression by the forces of intolerance when word arrived about the Rivera's mural, causing a stir in the audience. Near midnight, when the guests left the restaurant, "A stentorian voice was heard filling Avenida Juarez, saying: 'Let's go to the Hotel del Prado!' 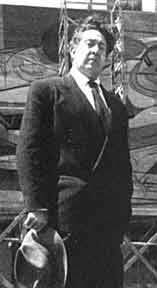 It was the voice of David Alfaro Siqueiros, who arm-in-arm with Jose Clemente Orozco and Dr. Atl, marched at the head of 100 people. Among them were the distinguished artists and writers of national and international fame: Diego Rivera, Gabriel Fernandez Ledesma, Leopoldo Mendez, Juan O' Gorman, Frida Khalo, Maria Asunsolo, Raul Anguiano, Jose Chavez Morado, Jose Revueltas, Arturo Arzaiz y Freg, and many others. Someone told the doorman of the hotel: "We are reporters." "Everyone?" he asked. "Everyone!" And the group marched to the luxurious dining room, where at this hour, amid the notes of a Chopin waltz played by a chamber orchestra, were dining at various tables the lawyer Aaron Saenz, the doctor Rafael P. Gamboa, Secretary of Health and Welfare, and the lawyer Rodolfo Reyes, untiring propagandist for Franco Spain. At the shout of "Death to imperialism!" hurled by Alfaro Siqueiros, the orchestra stopped, the waiters left, and the women present were startled as the artists entered the dining room. "Viva Madero! Viva El Nigromante!" the historian Dr. Arturo Arnaiz y Freg shouted at the top of his lungs. "Death to the Archbishops who bless whorehouses and beauty salons!" in his turn shouted Raul Anguiano. A woman, the granddaughter of Ignacio Ramirez, climbed atop a table and exclaimed: "The freedom of expression that made the words of El Nigromante and the fresco of Rivera possible must be respected." Diego Rivera then climbed on a chair, asked for a pencil and calmly began to restore the destroyed inscription: "Dios no existe." Juan O' Gorman held up a delicate cup containing water for the artist to moisten an improvised brush. Meanwhile vivas could be heard for Juarez, Madero, El Nigromante and the Flores Magons. After which Rivera, directing himself to Rodolfo Reyes, said: "As in Mexico, Franco is not in command." Directing himself to the manager of the hotel: "This hotel belongs to the people, it has been built with the money of the employees." He then threatened that the hotel manager be ousted by the workers. "And those that are there dining in evening clothes," pointing again at Rodolfo Reyes, "they will be finished like Mussolini: hung by the feet." Siqueiros then announced: "As many times as they take out the sentence we will come to paint it in." When the artists left the Hotel del Prado, the doorman, in his most correct manner, asked, "Shall I call a taxi, gentlemen?" A copy of Philip Stein's definitive biography on Siquieros belongs on the bookshelf of every artlover and student of history, particularly those with a love for Mexico. Purchase your copy of the book from Amazon.com by clicking on the ad at left. Content of this site owned by the estate of Philip Stein © Copyright. All rights reserved.